Uh-oh, narration. Uh-oh, magic. Uh-oh…. HOUDINI. 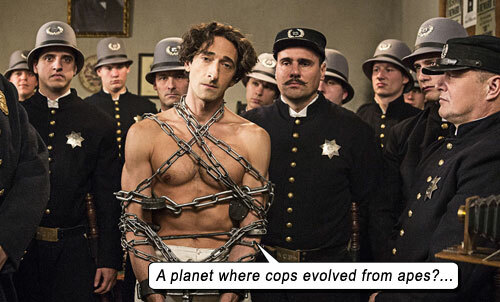 Adrien Brody stars (narrating interminably) as Harry Houdini, the greatest magician in history. But from this biopic, you’d never guess it. Upfront, Houdini is a god among men; an icon, innovator, pioneer, legend. And Adrien Brody, a fine actor, does his best with what he’s given to work with. But this Lionsgate TV production fails to capture the magnitude of Houdini’s charisma, the extent of his fame, and makes him a whining mental case who was seeking some kind of redemption for his wondrous, unique existence. As soon as Brody starts narrating his inner fears and aspirations, it’s all over. Houdini was and is an enigma. Nearly a century after his death, he is still the most recognizable name in magic. He couldn’t have possibly been as small as this film makes him. Uli Edel directs as Guy Ritchie Junior by way of Frank Miller. We see so many smash-cuts to Houdini’s internal organs, especially his rock-hard abdomen, that we feel like someone misses his med school diagrams. Film focuses on Houdini’s renowned ability to take a punch, and uses that visual as a metaphor for many situations. When someone insults him – a punch to the abs; when his mother dies – a punch to the abs. Every adverse situation meets the refrain: a punch to the abs. Story starts with Houdini’s humble beginnings playing a whorehouse (why people equate whorehouses with humble beginnings is another debunking essay altogether), where he realizes he can be more than just a magician, but a master “escapist” when a cop challenges him to escape some handcuffs. Then – uh-oh, flashback: young Eric Weiss (Houdini’s Jewish birth name) as an urchin on the streets of Budapest, Hungary. Eyes glazing over. We meet Houdini’s mother (which opens a can of Oedipal worms) and his father (a stubborn Rabbi who refuses to learn English in Chicago); brother Theo (whom Houdini would nickname “Dash” and later “Hardeen” – a tiny role for a big man in Houdini’s life). Kristen Connolly plays Harry’s wife Bess Houdini, with the acting skills of a turnip. She’d do best to stick to roles like CABIN IN THE WOODS, where she did not have to extend her emotions beyond Be Mannequin Pretty Then Die. Inevitably she would turn into the dreamkiller shrike, nagging at Harry to stop risking his life and get a job at McDonalds. Evan Jones (JARHEAD) is Houdini’s faithful liege Jim. We follow Houdini through many of his magic shows. Uh, why? Watching magic on film is nowhere nearly dramatic as watching it in real life. We know there’s a catch anyway – we don’t think he’s really “magic” – but now there’s the added medium of film, which is intrinsically linked to special effects which we take for granted. Where’s the drama? What’s the point switching to Ritchie-vision and showing Houdini extricating a key hidden on his person? Over and over again we are assaulted with Houdini’s magic. And a punch to the abs. Movie touches on Houdini’s espionage stint for the U.S. government, under the auspices of Chief John Wilkie’s Secret Service. There are extended sequences involving Sir Arthur Conan Doyle (David Calder), who – though the creator of Sherlock Holmes – was a clinically insane believer in the spirit world, thinking that Houdini was really passing through walls and contacting the dead. He would dog Houdini until death trying to prove his madness real. There’s the water torture cell (in a stupid introductory scene, Houdini simply “gets in it” to try it out without any prep on how to escape it, precipitating having to smash it), the chained jump into the freezing Hudson river, the disappearing elephant… there’s even a scene where a jailer locks Houdini in a cell and returns to find it empty, then shakes his fist at the air shouting, “Houdiniiiiii!” All that’s missing is the pan up and away. To a whole slew of young fans, Adrien Brody is now Harry Houdini, as Paul Michael Glaser was to the ’70s and Tony Curtis was to the ’50s. But to those who revere the man, the myth, the Mysteriarch, HOUDINI will probably make your eyelids heavy – and not in that good hypnotizing way. At least this HOUDINI gives us a more realistic summation of how Houdini met his death. His spiraling appendicitis was exacerbated by an unexpected punch to the stomach. There’s the answer to what Houdini was trying to escape – refrain: a punch to the abs. Writers: Bernard C. Meyer, Nicholas Meyer. Starring: Adrien Brody, Kristen Connolly, Evan Jones, Tim Pigott-Smith, Tom Benedict Knight, Shaun Williamson, Megan Dodds, Louis Mertens, Kata Sarbó, Faye Bradbrook, Tom Whitecross, David Calder, Linda Marlowe, Madeleine Potter. HOUDINI aired on The History Channel, Sep 2014.